Zazen has been transmitted since Shakyamuni Buddha until our days. Zazen is the posture of the Buddha´s Satori and since then, it has been transmitted exactly from master to disciple. It is the silent essence of Soto Zen. 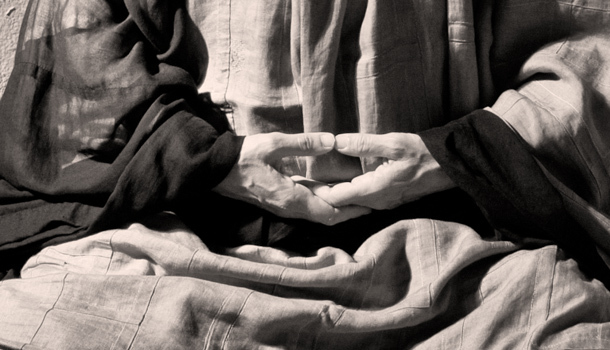 Zazen is based on the body´s posture, the breathing and the mind´s attitude. In this unique action we can find intimacy with ourselves, with the totality of existence here and now. We practice concentration in the unity of mind and body; Zazen or Shikantaza, only sitting, just the action of sitting. To do Zazen we sit in a zafu, the traditional cushion full of kapok. Legs are placed in lotus or half lotus position. Knees push the ground, head pushes the sky. The zafu allows for a good knee support against the floor and to lean the pelvis in a forward position, which permits a better body balance. The pelvis is leaned forward at the fifth lumbar vertebrae and, from this point, the spinal column straightens up on a straight back and the shoulders falling naturally. Nape and head are straight; chin is drawn back. Ears are aligned on the same plane as the shoulders, as the nose is with the belly bottom’s axis. Mouth is shut, tongue touching the upper palate. We breathe through the nose. Eyes are half open, and the stare is placed one or two meters in front of oneself. We join our hands against our abdomen at the belly bottom’s height, palms side up, left hand on the right hand. Both thumbs are in contact and make a straight line. Forearms and elbows are not attached to the body. During zazen we look for our body to follow exactly the posture´s norms, becoming the center of attention and concentration. We watch especially the position of thumbs, the look – placed on the floor, the chin drawn back and, little by little, all the aspects of this posture. It is an abdominal breathing, focused mostly on expiration; the inspiration comes naturally. This zazen breathing has influenced all the oriental martial arts since it allows to keep the gravity center in the belly. In zazen, concentration on a deep expiration has multiple benefits. It permits a better oxygenation of blood and internal organs. It also eases pains that could appear, especially when starting to practice. Breathing becomes the link between mind and body, helping in letting go of thoughts. During zazen, we practice observation and concentration. 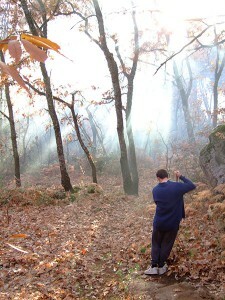 Observation of posture, breathing and mental activity. When body and mind become one, concentration is established. Correct mental attitude is lo let thoughts pass, not to cling to them. Thoughts always bring us to an unreal time, past or future. When starting zazen, the appearing thoughts are part of the superficial consciousness of our everyday human world. We let them go concentrating on posture and breathing. They come back and pass again. Other older thoughts appear but we always come back to the here and now. It´s not a question of reaching a blank mind, but of letting the current of the spirit flow towards the pure fountain, the source of Hannya, the Great Wisdom. How to recognize it? It is without duality and discrimination. We must go beyond thought and no thought. It´s the Hishiryo conscience, illuminating the present moment. Kin-hin is the perfect complement to a prolonged Zazen practice. It is done between two sittings. It consists of resting all the body´s weight on the foot which is forward, as if we wanted to leave our footprint in the floor and, at the same time, we stretch this leg, blocking the knee and prolonging this stretching to the spinal cord up to the head. All this in the interval of an exhalation. As in Zazen, the pelvis is leant in a forward position, chin is drawn back, the nape straight. The left hand encloses the thumb inside the fist, placing its root in the middle of the chest under the sternum; the right hand faces and surrounds the left fist. While we exhale, both hands press lightly against each other. Forearms are parallel to the floor, pushing both shoulders back. The look is placed two or three meters in front of oneself, in the floor, without letting our head hanging. Mental attitude is the same as in Zazen. Each time we exhale concentrated, we take root and expand with an energy such as that of a tree which, taking nutrients from the depths of the earth, expands and rises toward the sky. Only when the last breath is expelled we let air to come again into our lungs, inhaling naturally, letting go of the tension for a moment while we advance the other foot. Although every day has its time allotted for zazen, this practice may be diffused in everyday life by being attentive and present in our daily actions. When these actions are made for the Dharma, we call this activity Samu. During samu we develop the same spirit as in zazen; in silence, quietly, being calm and without the search of personal profit. This way, the energy obtained in zazen becomes a creative force used for the benefit of the community, reverting positively in our own practice. Above all, the samu we make manifests itself in the various manual tasks we perform, through which the body guides the mind: cleaning work, construction, horticulture, cooking and sewing, among others.